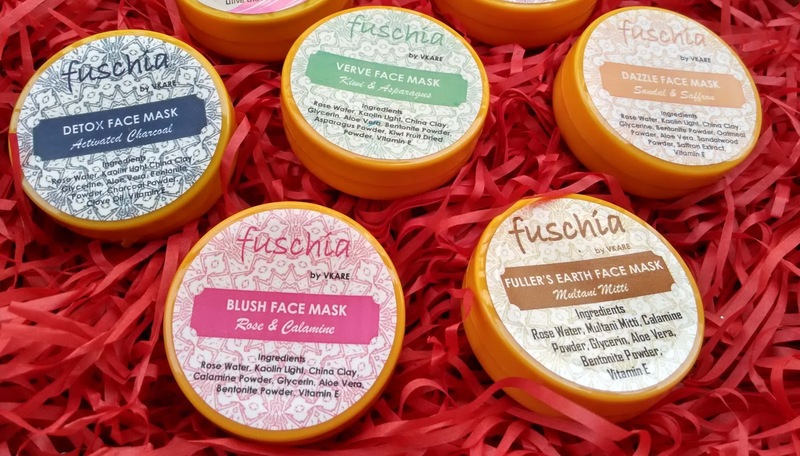 I have been the ardent lover of Fuschia products and from time to time I explore the brand for all their new launches and continuing the tradition I decided to get face masks for myself. Two months back I bought Fuschia Dazzle Face Mask (Sandal and Saffron) which I loved so much and I haven’t reviewed that on blog (which now I think I should have). Because I loved the face mask so much that I decided to order few other face masks for myself. 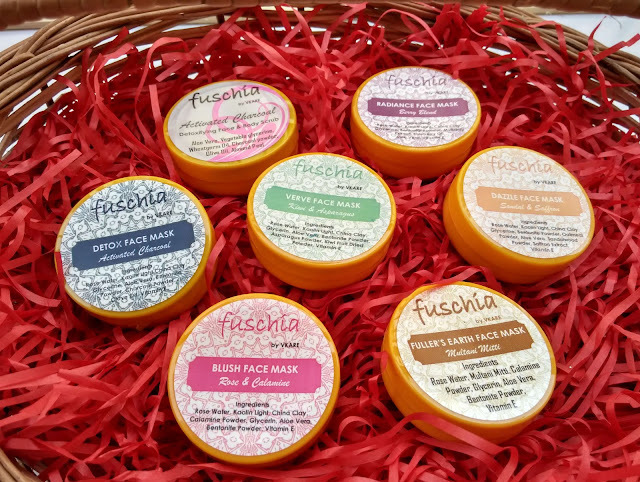 In this post I will share a mini haul of Fuschia face masks and will also post mini review or first impression kind for these masks. My skin mantra is that invest in good products rather than parlours, because if you will use good quality skincare products on daily basis than you don’t need parlour clean-up at all. Fuschia products are handmade using natural ingredients procured from around the world and these are free of SLS, Parabens and phthalates. Packaging – I ordered Fuschia Face masks in 15gm size and all of these come in similar packaging. A really cute looking mustard-yellow tub secures the face masks. On top the sticker with all the information about the particular mask is in different colour so that you can differentiate easily. Because of the compact size these are travel friendly. I ordered total seven face masks for myself. Fuschia Verve Face Mask With Kiwi And Asparagus – This face mask as name suggests has goodness of kiwi fruit dried and asparagus powder along with rose water, kaolin light, china clay, glycerine, aloe vera, bentonite powder. Fuschia Verve Face Mask is light green in colour and has mild fragrance. Keep it on skin for 10-15 minutes and then wash away. The skin looks with its regular usage. Fuschia Fuller’s Earth Face Mask – This face mask is enriched with multani mitti, calamine powder, glycerine, aloe vera, bentonite powder, viamin E. You will love its fragrance which is so divine. Once you apply the mask on face you want to keep it forever just because it smells so great. This is an amazing mask for oily skin especially in humid and changing weather. Fuschia Dazzle Face Mask Sandal And Saffron – I have used this mask before and if you have to go for a party and want to look fresh try this mask atleast two days before the event. The skin looks so bright and beautiful with its regular usage. Fuschia dazzle mask is enriched with sandalwood powder, saffron extract, china clay, oatmeal powder, aloe vera. The soothing fragrance of sandalwood will make you fall in love with this face mask again and again. Fuschia Activated Charcoal Detoxifying Face And Body Scrub – From the beginning of 2017 I have become fan of products that have activated charcoal in it. And this scrub from Fuschia does an amazing job. I have used it only on my arms and underarms. With regular usage of activated charcoal scrub the dark skin tends to lighten a bit. I am in love with this scrub and have booked the second unit already. Fuschia Activated Charcoal Detox Face Mask – Another good mask from Fuschia. This works wonder on your skin if you have to travel a lot (like city traffic, pollution). This is the first time that I am using a good smelling activated charcoal mask. Otherwise all smell like yuck. This is an amazing face mask to invest in. Fuschia Radiance Face Mask Berry Blend – Mulberry extracts, blueberry oil have been used as ingredients in this mask. This is again light green in colour with mild and soothing fragrance. I apply this a day before I have to attend a party or an event for that radiant look. Fuschia Blush Face Mask Rose And Calamine – With rose and calamine powder the blush face mask is again an amazing face mask for your skin. This doesn’t dry out your skin and makes it appear visibly clear. This isn’t a paid post or anything. I am going gaga about these products because these are worth appreciating. These are super affordable, natural products that can do wonders to your skin. If you planning something in skincare for yourself try these you won’t regret your purchase. I hope that this review was helpful.